Choose what you would want the most. Do you listen to music from the 60's? You are the type of person who sleeps a lot? Are you a big money saver? Your name means happiness. You were meant to be happy because you are amazing the way you are and also because you are one of a kind! Continue following what your beautiful heart says and you'll reach your goals and everything you've always dreamed of. Best of luck! Please check out www.MoneyProbs.com for more fun and knowledge quizzes!!! Also like our page @ www.facebook.com/moneyprobs for more awesomeness like this! Your name means adventure. You like going out a lot. You crave a lot of good Mexican food because it's extremely delicious to you. You make things harder than they are. Keep calm, and take everything easy if you want to reach your goals. Best of luck! Your name means graceful. You're full of amazing things. You make others smile, not sometimes but always. That's what's unique about you. You keep everything straight forward with everyone. You're the truth to everyone! Good luck with your careers. Your name means bird. You like to fly in happiness. You all about adventures and showing other you really are. That's what's awesome about you, you make other feel good being around you! Your name means Jewelry. You are a gold one. You're the treasure to many people. Don't make anyone sad because they always make you smile and enjoy your life! Your name means friendly. You are a person with a big, wide and an open heart. You make your surroundings feel extremely comfy and they are never bothered when they're with you! Your name means helpful. You give and you get even better. You need to continue doing what your heart says because it's going to get you to better places. Someday you'll enjoy your life because you will reach your goals! You name means future. You look ahead for what's next. You can tell it's coming your way. The good is. You should keep trying at what you're trying to do because you're getting there. You're so close. Best of luck! This interesting quiz will surprise you! It's a must take. 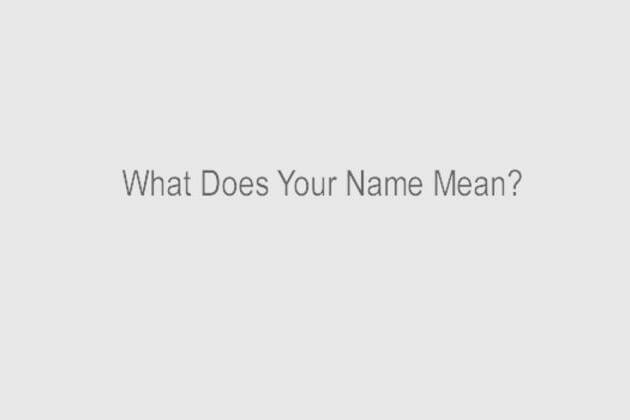 We can calculate your name and determine what your name means based on your personality! What is your name? We won't know, you'll just have to start this quiz and find out.